When thinking of fun dog training opportunities for our dogs, one sport in particular has become extremely popular – the sport of dog agility. I like this activity for primitive dogs especially because it involves both mental and physical energy, of which my dogs have plenty to burn! You do not need a ton of space to get some good work done, and best of all, you don’t have to compete to have a blast with your dog and develop teamwork. Before we delve in a bit further, a couple of health-related notes… As long as your dog is at a healthy weight and has no physical limitations, you should be good to begin at any age. Of course, you want to take some things slow if your dog isn’t used to them and thus may not have the proper muscle development. However, when it comes to puppies and young dogs, please use caution to not do too much in terms of patterned and cued jumping, bending, and twisting until they are old enough for their bodies to be fully developed (some puppies will run and play like this normally – that is not what I’m referring to, though still be a little cautious). Consult your veterinarian if you have any questions about this aspect of the sport, and consult your own doctor if you have any concerns regarding your own physical well-being. Injury is not uncommon, even for the most seasoned of competitors, both dogs and humans! So how can you get started in agility? It’s very tempting to just buy some equipment and put your dog over a jump or two. But that might not be the best idea. 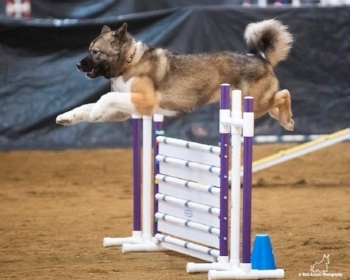 There is a lot of foundation work that goes in to agility, and even if you do not wish to ever compete or even to take an in person class, it is pivotal that you do some of this beginning work to ensure the safety of you and your dog. If you are looking at in person classes, ask to go take a look at a class first (without your dog of course! ), and make sure that they are not just putting dogs over equipment on the first week without any groundwork. While this post won’t give you exact exercises, I will explain a bit about what I like to cover with my own foundations students. Developing body awareness is one of the most important things in foundation training. Not all dogs know how to really use their bodies, especially when it comes to rear end awareness, so we generally have to teach them! This also goes for us as handlers. In foundations, we cover what our own bodies need to do to help show the dog what we want, in terms of indicating changing sides, coming in to us, and going out away from us. It’s amazing how much we are cueing them, even when we don’t mean to! The last important thing I like to cover is confidence and motivation. If your dog is worried about your motion, or scared of an object or obstacle, there is no way we can expect them to perform well. We work on building that confidence and trust, while learning how to properly motivate our dogs (or bring them down a notch if they are a bit too over the top!). If you have never seen a dog run an agility course, you should really go search around on YouTube for a while. It’s truly an amazing thing to see dog and handler totally in sync, both obviously having a great time. You will notice, however, that there are a lot of herding breeds (Border Collies and Shelties in particular) represented, and not too many of our favored primitive friends. But that’s OK! Don’t get discouraged! There are plenty of primitive dogs participating all over the world. And if you can’t find your breed of choice represented, then maybe you can be the one to change that! Whether you have the best backyard agility dog ever, or a podium placing dynamo, your dog is in it for the fun and won’t notice the difference – trust me! Do you do agility with your primitive dog? Tell us about your experiences and share your brags in our Facebook Community!